The cast of No Romance – from left – Catherine Field, Carmel O’Driscoll, James MacEoin, Sean McCarthy, Fachtna O’Driscoll, Mary O’Driscoll and Isobelle Nealon. 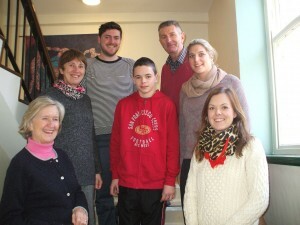 Skibbereen Theatre Society have been drawn to perform at the 2014 All-Ireland Confined Drama Finals in Claremorris, Co Mayo, on Tuesday, April 8th. Before heading there, they will be giving the final two Skibbereen performances of their production of ‘No Romance’ by Nancy Harris at the Town Hall at 8pm on Saturday and Sunday next, April 5th and 6th. Skibbereen Theatre Society have qualified for the All-Ireland Confined Drama Finals, which take place in Claremorris, Co Mayo, from Friday, April 4th, to Saturday 12th, inclusive, with their production of No Romance by Nancy Harris. They had their second victory of the campaign at the West Waterford Drama Festival in Ballyduff. There were no individual awards made there due to the adjudicator becoming ill during the course of the festival. On Saturday night, March 29th, they won the Clare Drama Festival at Scariff, with Catherine Field and Fachtna O’Driscoll winning the Best Director title, Fachtna also taking the Best Supporting Actor award and Carmel O’Driscoll the Best Supporting actress. Other festival results included second at the North Cork Drama Festival in Charleville, where Fachtna and Carmel O’Driscoll once again won Best Actor and Best Actress, respectively, and their daughter Mary won the Best Supporting Actress Award. Skibbereen finished third at the drama festival in Claregalway with Sean McCarthy winning this third acting award of the campaign – Best Supporting Actor – and the group also taking a very well-deserved Best Stage Crew award. Overall, Skibbereen had three wins, two seconds and a third placing in the six drama festivals they performed in. When the draw is made for the All-Ireland finals this Sunday, March 30th, further performance dates for No Romance at Skibbereen Town Hall will be announced here, so check back for details. 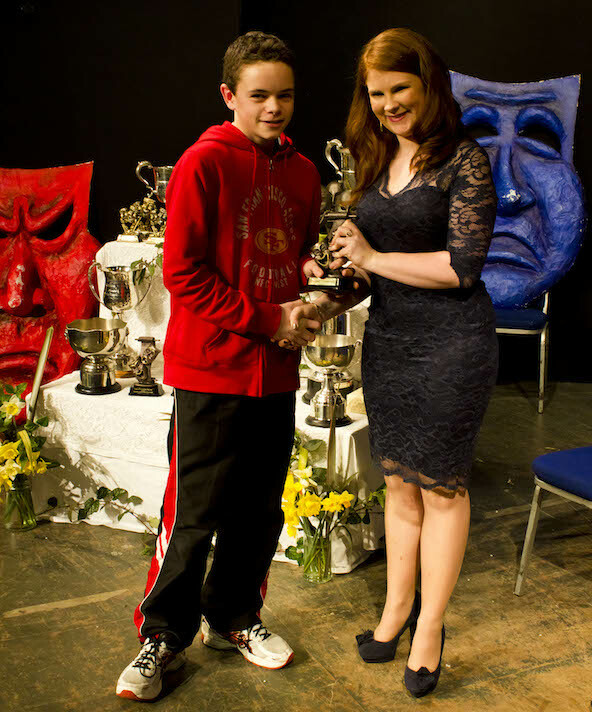 Sean McCarthy (13) from Skibbereen Theatre Society receiving a special adjudicator’s award for his part in No Romance by Nancy Harris from Catherine Deasy, secretary of the West Cork Drama Festival. It was a good weekend for Skibbereen Theatre Society as the first of the 2014 drama festival results came through, netting them a win, a second placing and several individual awards for their production of No Romance by Nancy Harris. On Saturday night, they were delighted with the news that they had won the confined section at the Kerry Drama Festival in Castleisland, where the husband and wife team of Carmel and Fachtna O’Driscoll won Best Actress and Best Actor, respectively, while their daughter, Mary, shared the Best Supporting Actress award with her stage partner, festival debutante Isobelle Nealon, and Sean McCarthy won the Best Young Actor title. The Best Director award there was won by Catherine Field and Fachtna O’Driscoll. On St Patrick’s Night, Skibbereen finished second at the West Cork Drama Festival in Rossmore and Mary O’Driscoll won the Best Supporting Actress award. Young Sean McCarthy won a special adjudicator’s award for his mastery of the nonchalant shrug! The death occurred on Friday, February 21st, 2014 of well-known Skibbereen character Frank McCarthy, who was truly a man of many parts. He was prominently involved in several organisations in the town for more than five decades. His working life was spent with the Department of Posts and Telegraphs and subsequently with An Post, serving with them from 1953 to 1988 in Carlow, Bantry, Roscommon – where he met his wife, Anna (née Mulhern) – and finally in his native Skibbereen, where he was known for his courtesy and helpfulness to post office customers there and in outlying branches. 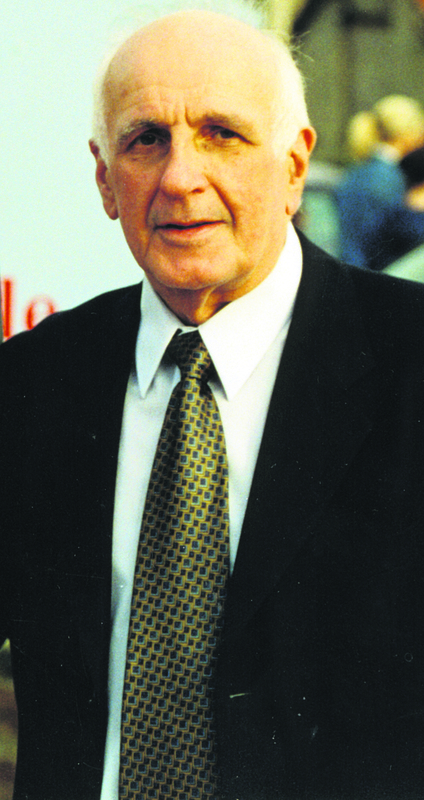 Frank McCarthy was actively involved in politics throughout his life as a member of the Fine Gael party. He served a number of terms as a member of Skibbereen Urban District Council and was its chairman on four occasions: 1971-72, 1977-78, 1980-81 and 1984-85. He was highly regarded by all political parties for his expertise as a tallyman at election counts and was always sought out by members of the press for his take on how the results were likely to turn out. He will be sorely missed at the local elections next May. 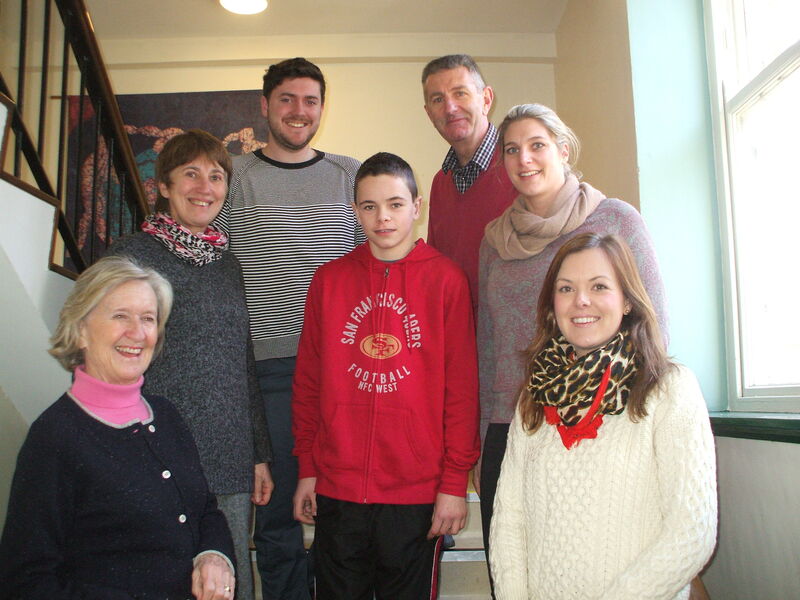 Frank was a founder member of several community organisations in Skibbereen, all working to promote the town, including Skibbereen Credit Union and the Junior Chamber, which started the Skibbereen Welcome Home Week and Maid of the Isles Festival. From its inception in 1969, and for its full duration, Frank McCarthy was centrally involved in the festival as chairman and, latterly, mainly as treasurer – a role in which he excelled. Sport was another of his hobbies – hurling being his first love. In the early 1950s, he won a Leinster junior championship with Carlow and, during his time in Roscommon, he became involved in the game there also. Back in Skibbereen, he was a keen follower of O’Donovan Rossa GAA Club, as his sons were heavily involved, especially in the All-Ireland club football final success of 1993. He was also a keen golfer in his day and served as both president and captain and of Skibbereen and West Carbery Golf Club. He was an authority on the rules of golf. Frank was also renowned as a knowledgeable quiz master. Apart from his family – of whom he was immensely proud – Frank McCarthy’s other big passion in life was drama. As far back as the late 1950s, he was part of the Cathedral Players in Skibbereen and was a founder member of the St Fachtna’s De la Salle Past Pupils’ Union, which staged the legendary pantomimes of the 1960s and ’70s in Skibbereen Town Hall, which drew audiences from far and wide. Frank possessed great comic timing and knew how to work audiences to maximum effect. He performed at the first West Cork Drama Festival in Rossmore and made his final appearance on stage there in 2003. He was proud recipient of a special presentation on the occasion of the 50th festival to mark his lengthy involvement with it. Frank McCarthy was a founder member of Skibbereen Theatre Society with whom he played may parts on stage and off, including that of chairman of the group for a number of years, during which they enjoyed great success on the amateur drama festival circuit. His last stage role with the group was in the Bernard Farrell comedy, Canaries, in January 2008. For the past 13 years, Frank McCarthy’s swansong role was that of O’Donovan Rossa in a number of historical pageants, including The Boldest Fenian Man, which he truly made his own and was very proud to play. His grandfather drove Rossa from the train station in Skibbereen when he paid his last visit to the town in 1904 to unveil the Maid of Erin monument in the Square, while in 1945, Frank’s father transported President Sean T Kelly to perform the official opening of O’Donovan Rossa Park in Skibbereen. Frank McCarthy, who lived at Coronea, Skibbereen, is survived by his wife Anna, sons Gearóid and Frank Junior, daughter-in-law Olivia, grandchildren Amy and Eric, sisters May, Sr Nora T and Breeda, brother Michael and other relatives and friends. At his funeral ceremonies, guards of honour were provided by members of the Fine Gael party, Skibbereen Town Council, Skibbereen Golf Club and Skibbereen Theatre Society. After requiem mass at St Patrick’s Cathedral on Monday, he was laid to rest at the New Cemetery in Skibbereen on Monday, February 24th, 2014.